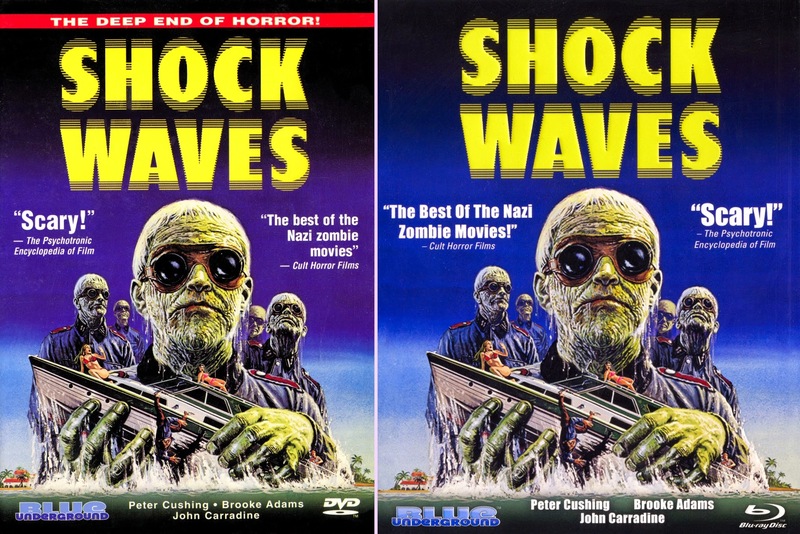 Blue Underground first released 1977's creepy Nazi zombie flick Shock Waves on DVD in 2005. 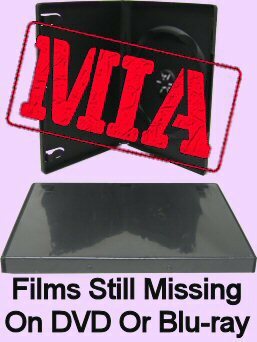 It's a cult fan favorite, but when people would bring up the possibility of a blu-ray upgrade, they'd say no, because the film was shot on 16mm, so it's inherently grainy and lacking in detail, and their print wasn't in the best shape anyway, so it wouldn't really benefit from an HD upgrade. But then, finally in 2014, they announced a blu was coming after all, even though, no, they hadn't discovered new, superior source elements. So... is this blu actually an upgrade at all? Were they just catering to fans eager for something they just didn't realize they didn't want? Or is this something really good here? Well, I've got both the original DVD and their new blu-ray release on hand, so let's find out! There's a reason it's lasted as a cult film after all. It's an earnest, well made horror flick... about Nazi zombies. There have been a few others, but none like this one, which manages to feel like a classic Hammer horror movie with its emphasis on dry dialogue and and a deliberate pace. 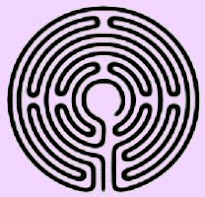 It relies on atmosphere and suggestion rather than gory monster attacks or gags. 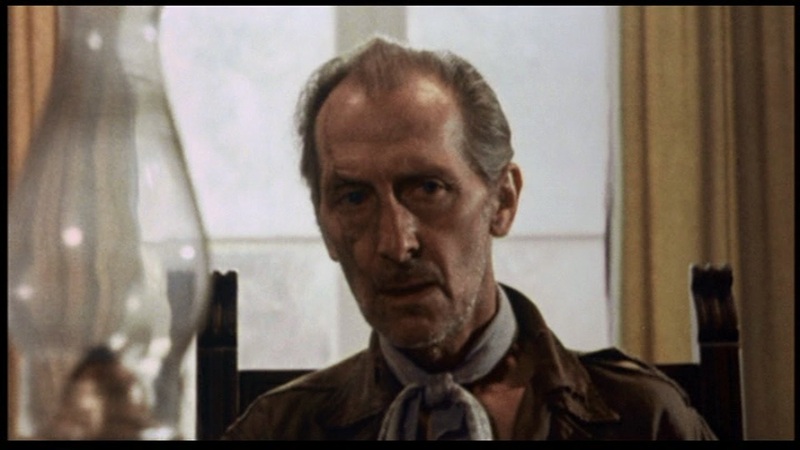 And of course it stars Peter Cushing, who naturally conjures Hammer as well. But it's actually an American film, shot in Florida. 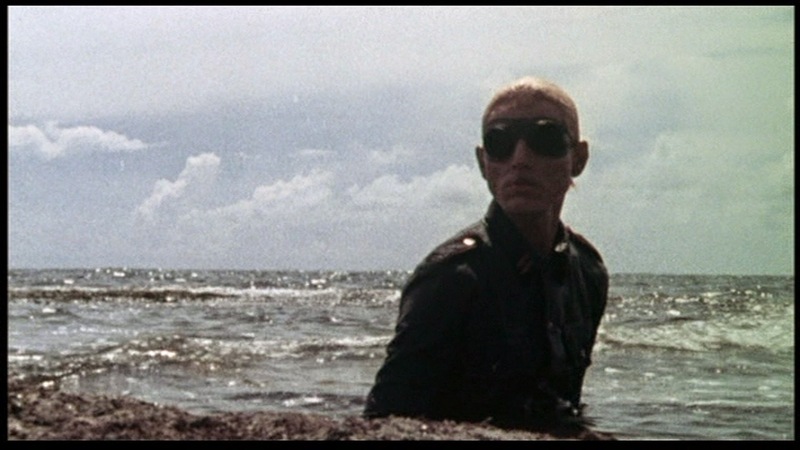 Boat captain John Carradine wrecks onto a nearly deserted island, but his cast of castaways (sorry) soon chance upon a rather large, abandoned house and set up camp. 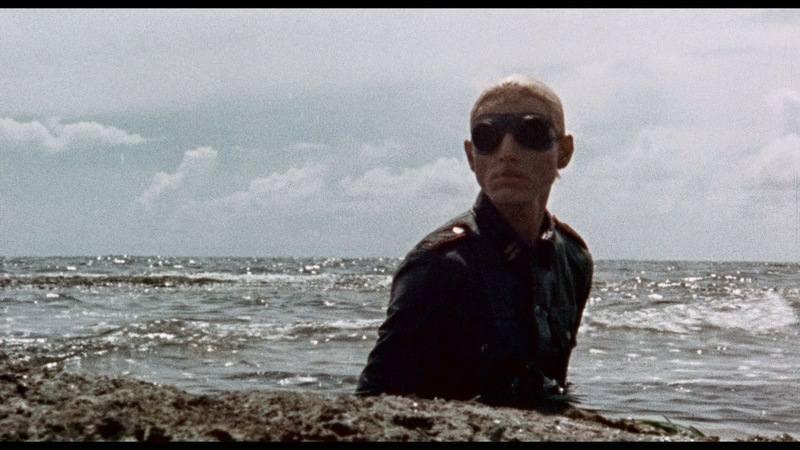 It turns out not to be so abandoned after all when a crazy-looking Cushing shows up and tries to warn them all away before they run afoul of a unit of Nazi soldiers bred to survive undersea for decades. They were an experiment abandoned when they turned out to be too dangerous and malicious even for the Nazis during wartime, but now they seem to be rising up out of the sea... It's slow, and the story's not exactly intellectually rewarding; but it's an effective, pre-slasher horror. Blue Underground's 2005 DVD on top; and their 2014 blu-ray on the bottom. Well, it does look better. Something's definitely different here. We get a sliver more picture (not just on the sides where the vertical black bars are, but also along the bottom. The grain, which is certainly present in both images, at least looks less splotchy on the blu. The colors look better - in the shots above, the DVD seems to be turning green on the right-hand side; not so on the blu. And the gamma and contrasted have been boosted up a bit, so his face isn't so lost in shadow. Let's look at another. DVD on top; blu-ray on bottom. Again, the image is clearer, brightness wise, less murky, and the color timing is different. 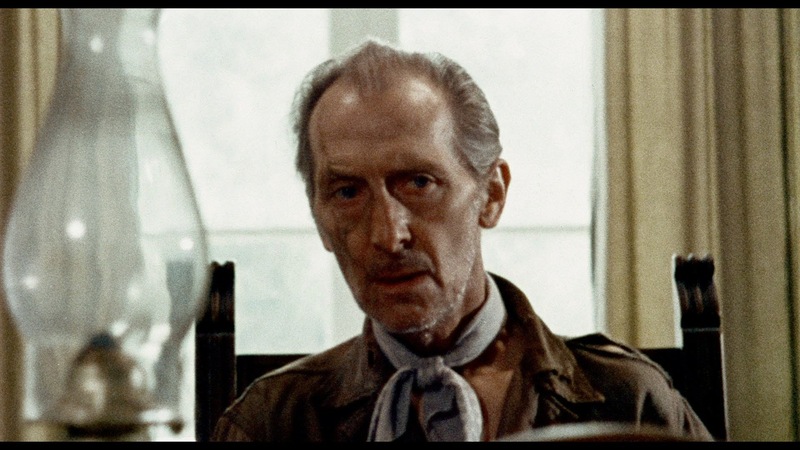 You also notice the additional picture more distinctly here, as we can see on the blu that Cushing's got something in front of him which was never visible on the DVD. It's not a huge upgrade. If you've got the DVD, I'm not sure it's so crucial to upgrade to the blu-ray just in terms of image. There's not really any new detail discovered in the move to HD. But it is a genuine, visible improvement. I certainly won't be going back to the DVD for future viewings. And you have to give BU credit for not doing any of the naughty things other companies would be tempted to with a print like this, i.e. try to scrub away all the grain with DNR or go nuts trying to find details in the naturally soft image with lots of sharpening and edge enhancement. Blue Underground appears to have done everything they possibly could with what's available. 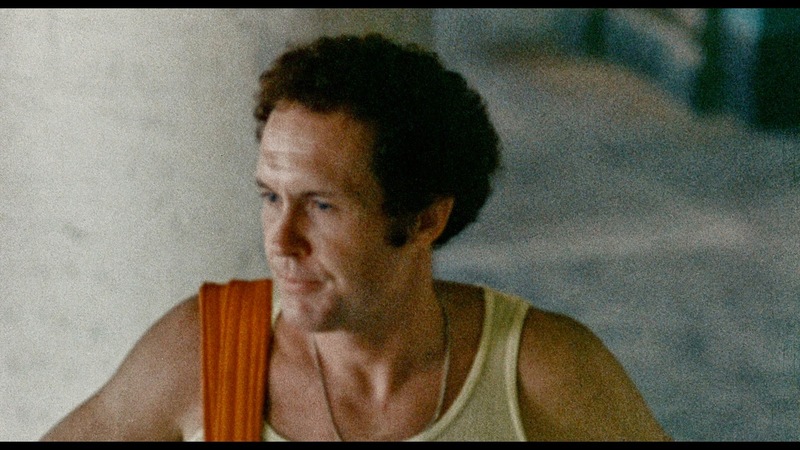 If it's still too grainy or soft for you, blame low budget 70s filmmaking; because even if you unearthed pristine, original camera negatives... well okay, that could help a bit. 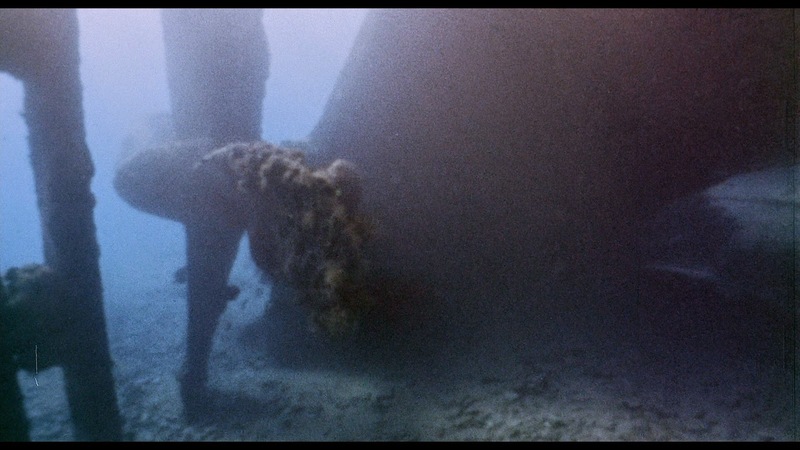 But it was shot on 16mm, and pretty much what you're seeing here is Shock Waves at its best. If you're not fussed about upgrading for the limited boost in picture quality, though, you might yet be tempted by the new extras. 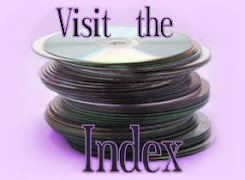 All the original special features from the DVD are ported over: the director's commentary and interview with actor Luke Halpin, as well as the trailers, stills and radio spots. But they've gone and added three new, all three of which are engaging and informative, and go some way towards making this feel like a special edition rather than just a DVD with extras. Producer and cinematographer Reuben Trane has the most to share about this film. He remembers it well and covers everything from coming up with the original idea, shooting with the cast, and its subsequent history as a finished film. Richard Einhorn is knowledgeable and enthusiastic about this being on of cinema's first electronic scores. And finally Brooke Adams speaks cheerfully about auditioning for the role, working with Carradine and more. So if you haven't already got the DVD, this is unquestionably another strong release from Blue Underground in its own right. And if you have got it, you might want to prioritize other upgrades before this one. But I'm happy to report that it is a real, visible upgrade.